Tickets for the Friday, November 9, 2018 screening groups at 7:00 pm and 9:15 pm are on sale now. Click here for tickets! The 29 Days Later Film Project, now in its 10th year, gives filmmakers extra motivation to make a film and get their projects completed in front of a screened audience. 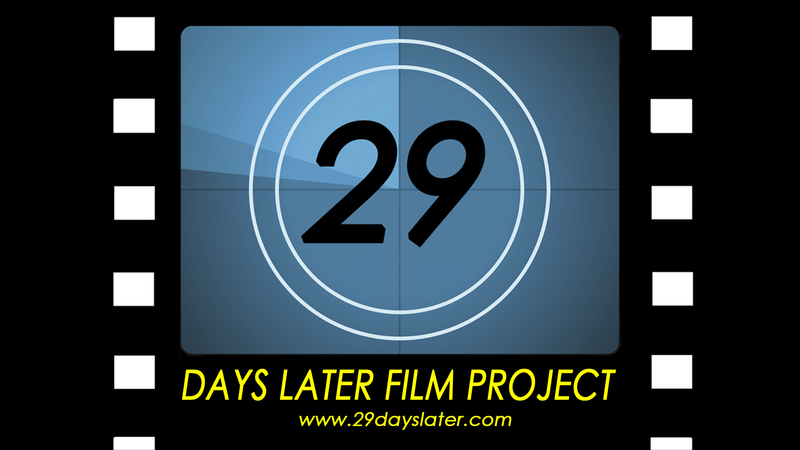 Whereas some competitions are geared toward super-fast creation of a film, the 29 Days Later Project gives filmmakers of all abilities, from beginner to pro, additional time to complete and polish their work. Andrew Felix of Linkwater Films and Stephen DeCubellis of Bladder Productions at the first 29 Days Later kick off. Awards include a cash grand prize and the Judith Rheiner Independent Spirit Award trophy for the festival winner; the Michelle Ann Farrell Award for Innovation, and certificates for categories such as cinematography, directing and acting. More prizes to be announced. A panel of judges will be responsible for naming the top films. Wednesday, September 26, 2018, 7 pm (doors open 6:00 pm). Creative Alliance, 3134 Eastern Avenue, Baltimore, MD, 21224. At least one member of each team must be available to get the prop and register. Thursday, October 25, 2018, 7:30 p.m. Teams should submit their films online via Google Drive or Dropbox. If you cannot submit online, we will meet at Sharky’s Bar and Grill (2819 Eastern Ave, Baltimore, MD 21224) for physical media submissions via DVD data disc or flash drive (see Preferred Format section for more info). Teams will have a 29 minute grace period, but films not received after 7:59 p.m. may not be eligible for awards and are at risk of not being screened. Feel free to submit your film early online in case technical issues arise. There will be two separate screenings on Friday, November 9, 2018 at 7:00 pm and 9:15 pm at the Creative Alliance (3134 Eastern Avenue, Baltimore, MD, 21224). We will announce Group awards at the end of each group screening and overall festival awards at the end of Group B! Teams are listed here. Some other film competitions are charging up to $175 per team; we are only asking a small fee to help us cover our expenses, prizes and time. Our 2017 team registration rates are: $65 for early bird registration by July 16, $75 for regular registration by July 26 and $85 for late registration after July 26 and at the door. Each team will be entitled to three free tickets to the screening group of their choice. Stay tuned to learn about upcoming discounts associated with 29 Days Later. Film must be completed in 29 days and use a prop that we provide at the kickoff; the prop does not have to be the focus of the film. Films must be 4 to 9 minutes (including credits). Shorter films within the range are encouraged if possible due to the number of films that will be screening in one night! Your film must also include this 29 Days Later title card in 1080 or 720 format (right click and select “save link as” to download) at the beginning or end of your film. Also, we ask that you do not post your film online or screen it until at least one week after its grand premiere at the 29 Days Later Film Project. Films will be shown via a an HD projector. Preferred format is an exported HD file (if shot in HD): for example M2TS, M2T, M2V, MOV, MP4, AVC, AVI, WMV – whatever the best possible quality is. This should be submitted online via Dropbox or Google Drive to deanstorm1@gmail.com. If you are unable to submit online, please burn on a data DVD. If you do not have a DVD burner, a flash drive is acceptable (preferably formatted to be read by a PC). Note: Media will not be returned. Filmmakers own the rights to their films and may submit in film festivals or look for distribution. We are only asking for the right to use still frames for promotional materials. Your film may also appear on our web site, or in a 29 days later online site compilation or DVD/Blu-Ray if you grant us permission. Please contact organizer Dean Storm at 29daysfilm@gmail.com.